It’s one of the most powerful ideas in the world: the possibility that we can communicate with the dead. But some people don’t think it’s just a possibility: they think it actually happens. In many traditional religions, communication with spirits is taken for granted. Tribal priests known as shamans bring messages from the land of the dead, where they travel with the help of chanting and mind-altering herbs. There’s even an episode in the Bible in which King Saul asks a witch to raise up the spirit of the prophet Samuel. But Saul sinned by doing that, breaking the stark commandment laid out in the Book of Exodus: “Thou shalt not suffer a witch to live.” Judaism was very hostile to traditional religions and that hostility passed to Christianity. For many centuries, anyone who wanted to speak to the dead had to try in secret, fearful of being reported to the authorities, put on trial and executed for witchcraft. That changed in the nineteenth century, when the churches were weaker and less able to crush new ideas, particularly in America. That’s where a new religious movement was born. It began in New York in the 1840s when three young sisters convinced their elders that they were mediums, or blessed with the ability to get in contact with the spirit world. They could summon ghosts and receive messages from them in the form of knocks and rappings during séances, or special gatherings held for this purpose, often in darkened rooms. That was the small beginning to what became a huge movement: Spiritualism. It received an important boost in 1861, when the bitter slaughter of the American Civil War began. Countless families lost fathers, sons, uncles and nephews before the war ended in 1865. Spiritualism held out the promise that these lost men could still speak with their loved ones, reassuring them that the afterlife was a calm and beautiful place where they had found peace and happiness. Mediums would allow themselves to be taken over by the spirit of a departed person, who would then speak through them, answering questions and describing the spirit world. Or so Spiritualists claimed. Whether the messages were genuine or not, it’s easy to understand why so many people were eager to believe them. Spiritualism spread across America and around the world. It even survived a damaging confession by Margaret and Kate Fox, two of the sisters who had helped create the movement in New York earlier in the century. They said that the three of them had been playing tricks, creating the knocks and rappings themselves. But that confession, long-standing hostility from mainstream churches and criticism from many others made no difference: Spiritualism survived and underwent a great revival in the early years of the twentieth century during the First World War. Once again countless families lost menfolk and once again they turned for consolation to Spiritualism and its séances. 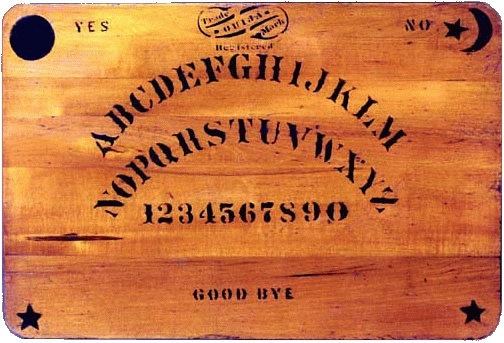 By then so-called ouija boards (pronounced “wee-jaa”) were in very popular. They were wooden boards equipped with a sliding pointer. When a circle of people placed their hands on the pointer, a spirit was said to guide it to letters of the alphabet printed on the edge of the board, spelling out names and words. Ouija boards were also usually printed with the words YES and NO, hence their name: “oui” and “ja” are the French and German for “yes”. Some of the mediums who organized such séances were undoubtedly fake, ruthlessly exploiting the bereaved to make money for themselves. But other mediums were sincere, truly believing that they could receive messages from the dead and assist grieving families to accept their loss. And some very intelligent and influential people championed the Spiritualist cause. Sir Arthur Conan Doyle, the creator of Sherlock Holmes, was convinced that Spiritualism was genuine. He wrote books and articles in its support. The famous magician Harry Houdini also took an interest, but he was sceptical and helped to expose fraudulent mediums. That was many years ago, but Spiritualism has survived to the present day. Throughout the world people are still gathering to receive messages from their departed loved ones. Whatever we think about the claims of Spiritualism, it’s easy to understand their appeal. Death can be a very destructive and ugly thing, shattering the lives of those who are left behind. That’s why we find funerals so important: they restore calm and dignity to the dead, allowing us to say goodbye in a planned and peaceful way. It would be even better if we could speak to the departed person and learn that they were now happy and fulfilled in the afterlife. For nearly two centuries, that is precisely what Spiritualists have said we can do.